The Ashton community is well-known in Ben Hill County, but nearly forgotten otherwise. It’s the neighborhood where my father grew up, a community characterized by farms and farm families who have been in the area for generations. 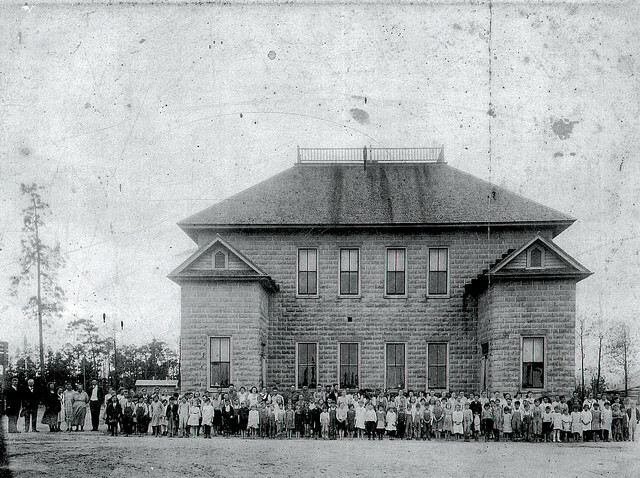 Most people are familiar with the present Ashton School building, a WPA structure now privately owned and used as apartments, but until Karen Luke shared this photograph with my father recently, I never knew there was another school at the location. It appears to have been built with blocks from the Fitzgerald Granitoid Works and I’d estimate that this image dates to about 1910. Unfortunately, I don’t know the names of anyone in the group, but it appears that the entire community turned out for the photograph.